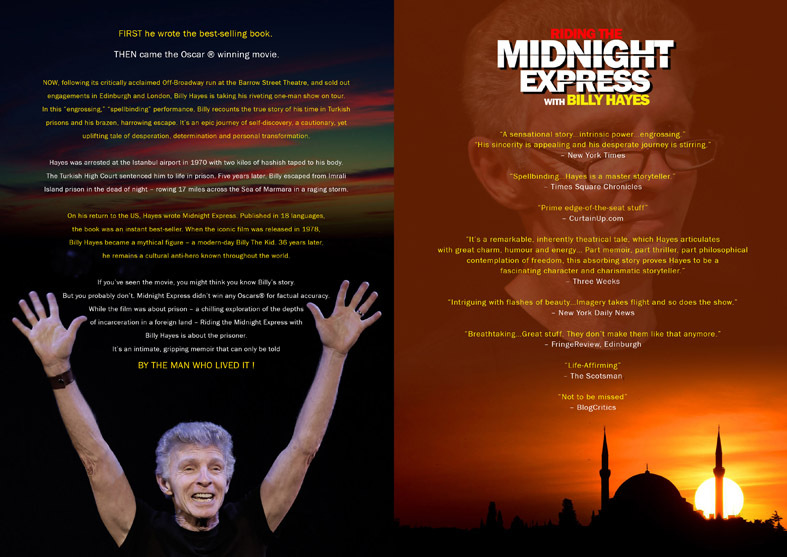 Billy Hayes, the man who lived the experience which the oscar winning film «Midnight Express» was based upon, will be performing from April 29th until May 1st in Beirut, his monodrama Riding the Midnight Express. We asked him some questions to understand his path and how he would describe his experience. —My girlfriend wasn’t with me when I was arrested. 2-Somehow all this adventure had positive effects on your life. You met your wife in Cannes during the screening of the movie. You wrote books, now you travel telling about your experience. Can we consider it’s the major event that changed your life? Do you think that imprisonment changed you in a better man, awakening your sense of responsibility? Turkish prison was the worst and the best thing that ever happened to me. It forced me to grow up and take responsibility for my actions. I learned about strengths and weaknesses I never knew about. I got my books written and published. I met my wife at the Cannes FF when the movie premiered there in 1978. My experience in Turkey was truly the pivotal point in my life. Everything is before or after Turkey.